Appearing on MSNBC, Monday, to promote his new special on Barack Obama, Chris Matthews attacked "older white people" for still holding bigoted feelings against the first African American President. Lavishing praise on younger Americans, he added, "And I think that's a generalization and I'll stick with it. I think younger people do not see race as an obstacle." He then touted the "non-judgmental" attitude of Obama voters, fawning, "In fact, they say [race is] irrelevant and don't even notice it, whereas older people notice it all the time." If "older white people" are focused on race, Matthews could certainly be one of them. On January 27, 2010, after Obama's State of the Union address, he oddly alerted, "You know, I forgot he was black tonight for an hour...I was watching, I said, 'Wait a minute. He's an African-American guy in front of a bunch of other white people, and there he is, President of the United States, and we've completely forgotten that tonight.'" 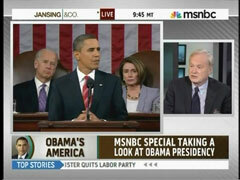 Matthews appeared, Monday, to promote Obama's America, a special edition of Hardball airing at 7pm on January 17. It will look at how the President has handled the first two years of his presidency. Matthews broached the subject with Jansing by complaining, "I think older Americans, older white people still have a problem with this guy." CHRIS JANSING: How about President Obama? CHRIS MATTHEWS: Well, it's two years and tonight we're honoring that as well as the Martin Luther King Day and it's sort of an interesting overlay, the two of them. The first African-American president, no matter what we say, it's non-ethnic, non-racial about the President, I think that's appropriate 90 percent of the time, it is historically important and it will be marked I think by a lot of people in history books that he is the first African-American president and how well he did. You know, my own view, the American people are very proud of this country, and it's the thing we don't talk about usually in politics. How proud we are of this country and we know when we think about it we're a great country. We're not a little country. We're a great country and we want to have great presidents. You're not happy to have a string of second-rate presidents, we like to have great ones. And maybe that's one of the things we don't talk about that's going in the favor of this president. We had Reagan who, whatever you think of his politics, came off in the history books, he will, I think, go down as one of our great president. And Jack Kennedy, no matter how short will go down in our history books. And, certainly Franklin Roosevelt and Harry Truman. We've had great presidents and some who have not made it politically. And I think the American people on average when they're in a good mood, which they often are, want our presidents succeed, want our presidents to succeed, no matter their politics. JANSING: Let me play a clip from tonight's program. Then we'll talk a little more. UNIDENTIFIED: After the election, I think because some of the hard slogging and the politics, he didn't become that inspirational personality. Ronald Reagan in his first two years, he had more unemployment, he didn't have a financial crisis, but Reagan was able to keep up that inspiration. DAVID ABERSHIRE (Ctr. For Study of Presidency and Congress): And he is finding his middle ground. Congress, congressional leaders, Republican leaders, to meet him on that common ground, he may get something done. MATTHEWS: Did you see the age difference there? JANSING: What would you say it is? MATTHEWS: It means- it's significant. I think older Americans, older white people still have a problem with this guy. MATTHEWS: And I think that's a generalization and I'll stick with it. I think younger people do not see race as an obstacle. I don't think- I think, they're much more non-judgmental. In fact, about ethnicity, they just say that's not relevant- In fact, they say it's irrelevant and don't even notice it, whereas older people notice it all the time. — Scott Whitlock is a news analyst for the Media Research Center. Click here to follow him on Twitter.